Hello, friendly friends, and welcome the latest last instalment of Will It Sous Vide?, the column where I make things with my immersion circulator. I had originally wanted to do something a little more grand, but circumstances beyond my control prevented me from doing so. My grandmother is a lovely woman, but her kitchen — while gloriously decorated with many fine ceramic chickens — is lacking in basic necessities such as more than one cutting board, a single sharp knife and counter space. (I mean, there is a kitchen counter, but it is mostly covered with the aforementioned chickens.) There is also no working oven, save for that of the toaster variety. Given the limited nature of the kitchen, I decided to do something simple, but elegant. I decided to go with sous-vide pears in red wine. 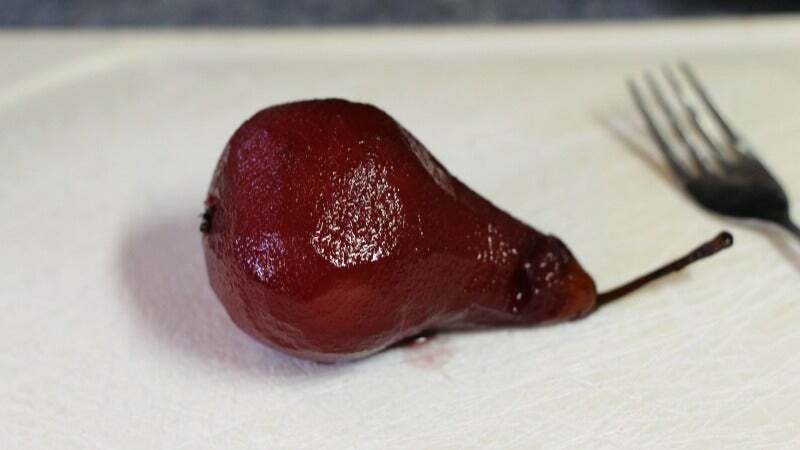 If you've ever made poached pears, you know that it's not exactly difficult, but you have to keep an eye on them in their simmering liquid, and turn them every once in a while. As with most sous-vide cooking, the beauty of cooking pears this way lies in the very small amount of attention you have to pay to them once they are in the bag, so to speak. This choice meant I needed to acquire not only pears and wine, but some mulling-type spices, as my grandmother's spice rack is 90 per cent garlic salt. I had initially planned to grab a vanilla bean, cinnamon sticks, cloves, fresh ginger and star anise, but it was not meant to be. The first grocery store had a single piece of ginger in plastic packaging, but it had a crown of fuzzy mould, so I skipped the ginger. There were also no vanilla beans or star anise, so I grabbed some cinnamon sticks, vanilla extract and whole cloves and left. 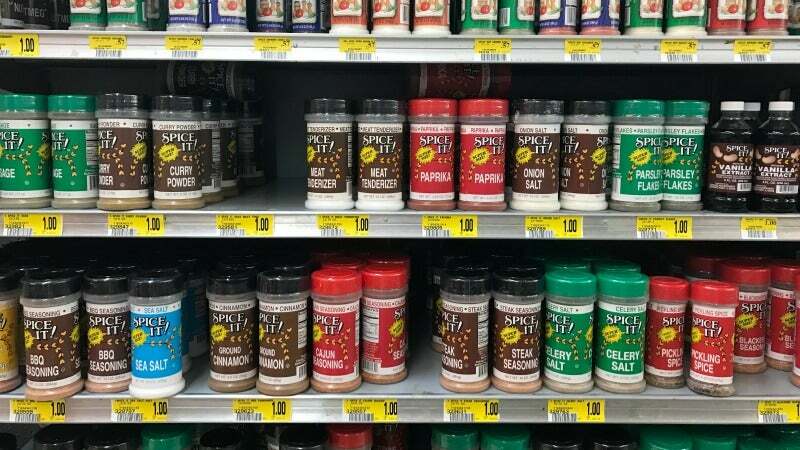 I then went to the Piggly Wiggly, whose spice section was even more lacking. 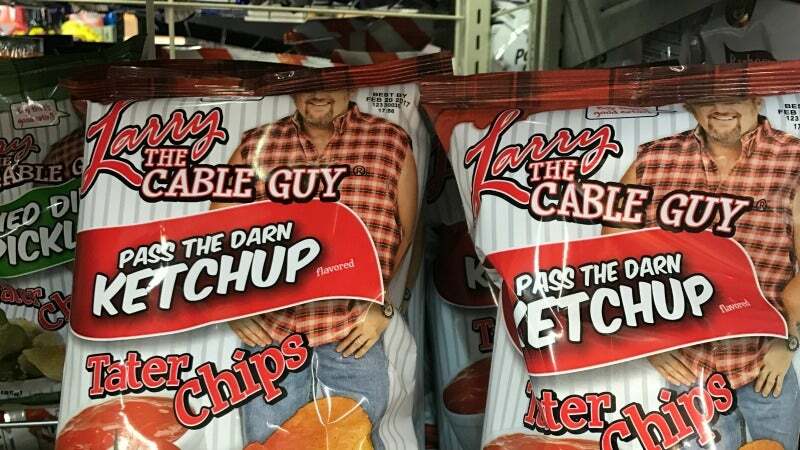 They did, however, have a brand of chips I'd never seen before. I left Piggly Wiggly, and went to the liquor store. I grabbed a bottle of malbec and headed back home. Do you recall earlier, when I said my grandmother's kitchen was lacking in certain tools? This actually shouldn't have surprised me, but there was no corkscrew to be found, not even a decorative one. "We used to poke a hole in the cork and push it in the bottle," my father suggested, and off he went to get the tools. 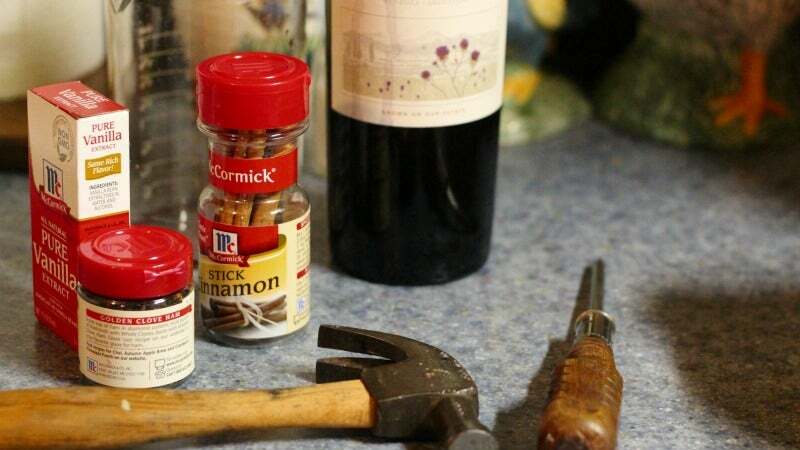 My grandmother didn't have a corkscrew so I tried to lifehack it. 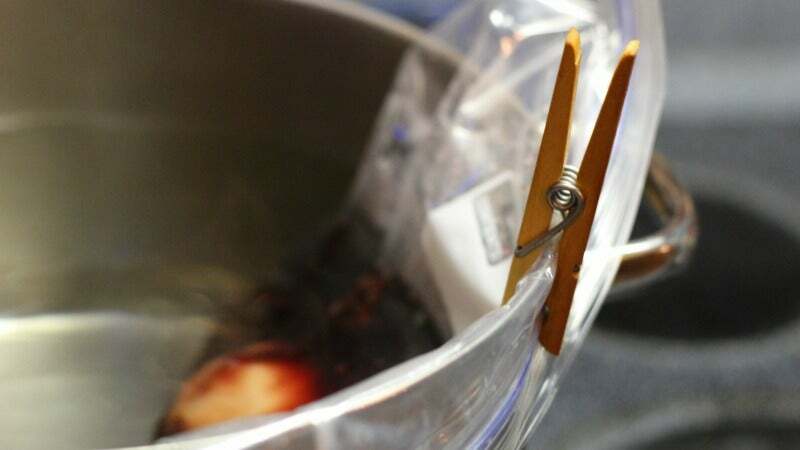 I then put the freezer bag full of wine, fruit and spices in a water bath set to 80C (which is in between the two temps ChefSteps recommends for sous-vide fruit) for 45 minutes. 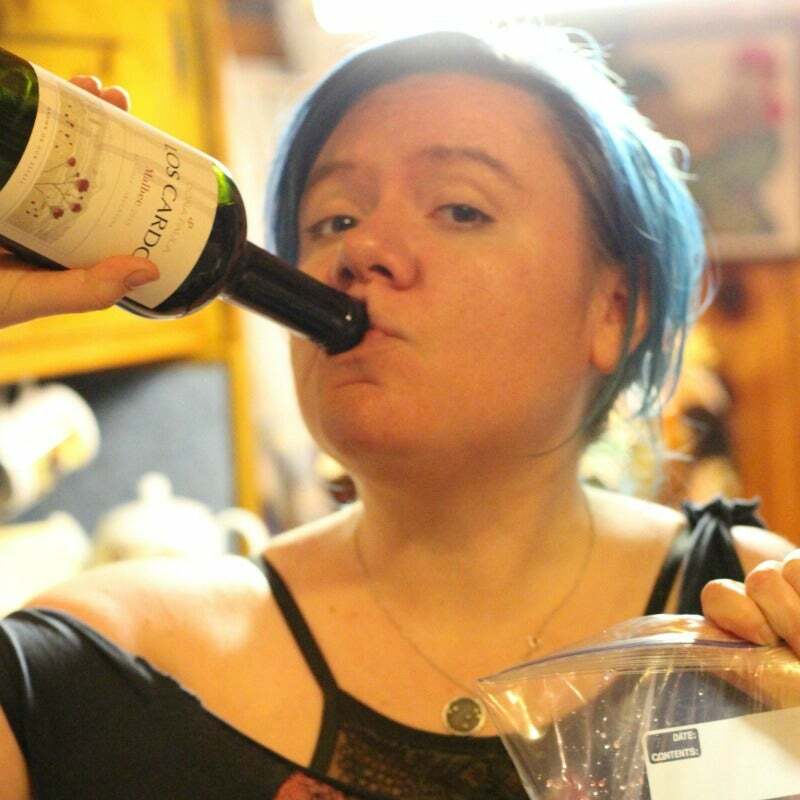 While the pears were sous vide-ing, I consumed the blood of my enemy (wine that had sprayed my face and "Music From Big Pink" shirt). After 45 minutes of sous vide-ing, I gave my pair of pears a poke and was thrilled to find that they were soft and supple. 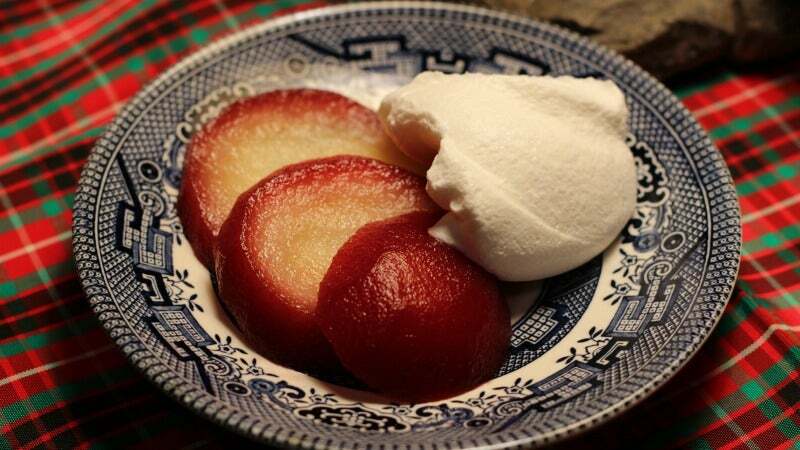 I sliced them, topped them with some Cool Whip (imitation whipped cream — there was a container in the freezer that didn't make it into the cherry salad) and served them to my grandmother. She enjoyed them immensely. And now it's time to ask our favourite question: Will fruit — specifically wine-poached pears — sous vide? The Answer: Yes, they will, and they are quite lovely. These pears were warm and soft, but not mushy, and infused with deep, sweet, wine-y and spicy flavour. 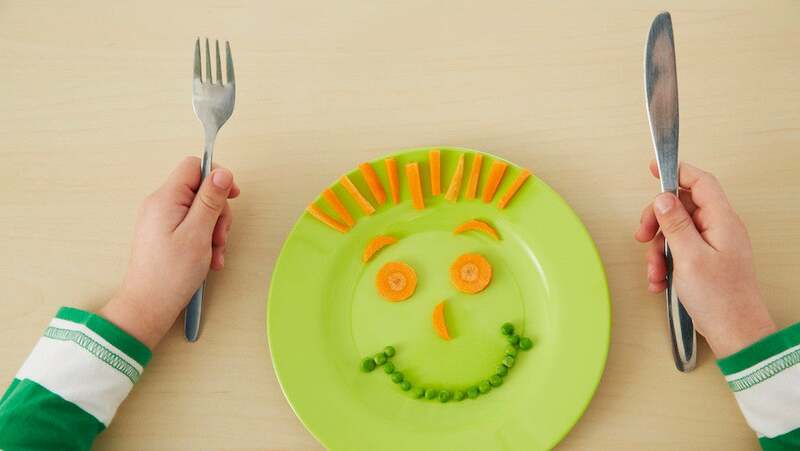 If I were to change anything, I would have backed off on the the sugar a bit, but my grandmother seemed to think they were just sweet enough, so it's a matter of preference. In addition to being delicious, the impress-to-stress ratio on these babies was extremely favourable in the direction of "impress". There's barely any cooking at all, but I dare say that this is a most elegant-looking dessert that would be right at home as part of celebratory spread. As a bonus, you also get a very tasty, sweet, poaching liquid that has lost none of its ethanol, due to the fact that there was nowhere for it to evaporate to. It was a little too sweet for me to drink as-is, but it would be delightful mixed into a cocktail, and you could always reduce it down into a syrup for the pears. Basically, sous-vide wine-poached pears are a win all around, especially if you have a corkscrew. Nice one, Claire! 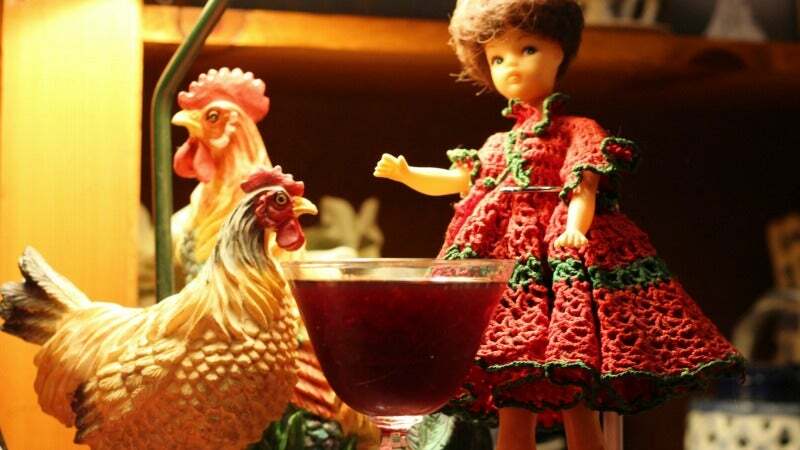 I especially enjoyed your, uh, wine experience photos. Can't believe you passed up on those chips.